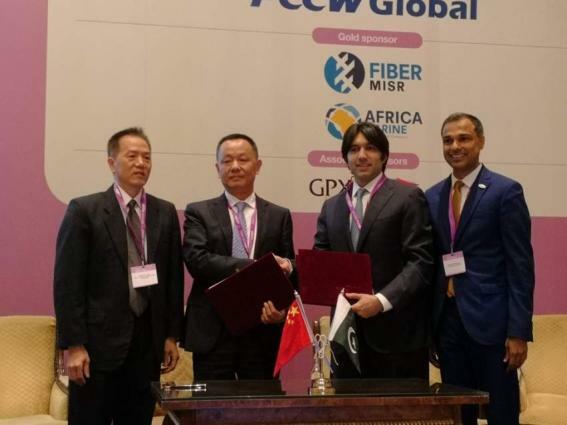 Karachi (UrduPoint / Pakistan Point News - 17th Apr, 2019 ) A Cable Landing Party Agreement has been signed between PEACE Cable International Network Co., Ltd (PEACE Cable) and Cyber Internet Services Pvt Ltd (Cybernet Pakistan). This landmark agreement, signed on 16April2019at Capacity North Africa in Cairo, follows a Memorandum of Understanding signed by both parties in 2018. Pakistan & East Africa Connecting Europe (PEACE) is 12,000 km long, privately owned cable system that provides an open, flexible and carrier-neutral services for its customers. PEACE is targeted for completion in Q1, 2020.The system design will adopt the latest 200G technology and WSS technology, which provides the capability to transmit over 16 Tb/s per fiber pair, servicing growing regional capacity needs. The PEACE cable system with landings in Pakistan, Djibouti, Egypt, Kenya and France --- in the first phase -- will connect the three most populated continents in the world, providingcritical interconnection to the economic corridors of Asia, Europe, and Africa.A total capacity of 96 Tb/s will be added to Pakistan’sinternet infrastructure. Cybernet, amongst Pakistan’s oldest ISPs,is the PEACE Cable Landing Station Partner in Pakistanand will bedeploying PEACE Pakistan Cable Landing Station (CLS) and managing its operations. With over 22 years of experience inbuilding and running countrywide fiber broadband operations, IP/MPLS networks andcloud optimized data centers, Cybernetwill bebuilding Pakistan’s firstcarrier-neutral cable landing station for PEACE cable by Q1, 2020 inKarachi. The design and selection of the CLS site in Karachi is in line with Cybernet’sobjectives to bring carrier neutrality and much needed redundancyto Pakistan’sinternet backbone. Cybernet will provide capacity to local and global carriers, CDNs, contentproviders and others at easily accessible interconnect points across Pakistan -- enabling true carrier neutrality and open access. Cybernet is on a mission to bring affordable ultra-fast broadband on its own fiber network and in partnership with mobile and other fixed line carriers to the far reaches of Pakistan. The PEACE cable project will enable carriers to extend gigabit speeds to the Pakistani population and will be instrumental in meeting the exponential growth inbandwidth demand frommobile and fixed broadbandusers in Pakistan and neighboring countries. “We are humbled to be able to contribute in bringing a submarine cable system that will have an outsizedimpact on the digital landscape in Pakistan. PEACE is the only cable system that originates in Pakistan and connects 3 continents (Asia, Africa and Europe) and elevates our country’s strategic standing in the global connectivity race.